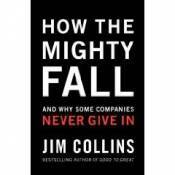 Waterline Principle - How the Mighty Fall: And Why Some Companies Never Give In. How you ask a question can influence the outcome of your decision. In the case of the Challenger crash in 1986, somehow the question to launch got changed 180 degrees from “Can you prove it’s safe to launch?” the traditional launch decision question, to “Can you prove that it’s unsafe to launch?” The result; the O-rings that seal joints when the rocket fuel ignites failed to perform their job sufficiently due to the lower temperature NASA decided it wasn’t unsafe to launch at. Diane Vaughn’s book The Challenger Launch Decision is the source that Jim Collins in How the Mighty Fall: And Why Some Companies Never Give In cites to show a key lesson. Facing an irreversible decision that has significant, negative consequences, if it goes awry, then making that decision should require a superiority of evidence that it’s safe to make that decision. Stage three of How the Mighty Fall is denial of risk and peril. Companies that enter stage three fail to face the brutal facts, or simply ask the wrong questions. Motorola is an example that Collins points to as a company that bet big on Iridium global personal communication system when the weight of accumulated empirical evidence was unclear or at worst was against success. Texas Instruments on the other hand is an example of a company that bet big to invest in DSP [digital-signal processing] only after the evidence from small scale experimentation and development weighed heavily in their favor. So how do you make decisions when a great deal of risk and uncertainty is at stake? The idea is to think of yourself on a ship. Imagine that any decision you make that goes bad will blow a hole in the side of the ship, below the waterline. Damage to a ship below the waterline can mean catastrophic consequences. Even a small hole, albeit a lengthy one, sunk the “unsinkable” Titanic. In the case of the Challenger had they really considered the outcome of question three they certainly would not have launched. I used this criteria recently when making a decision about my business and found it most helpful. Collins points out that decline is largely self-inflicted, as is the path to recovery. The good news is we are not imprisoned by our circumstances, our history or even the dramatic defeats we’ve taken. Hope remains for recovery. Insights on that in the next blog.